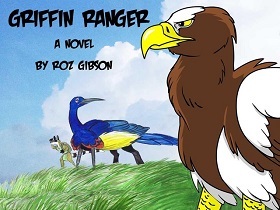 Roz Gibson's Kickstarter campaign for the novel Griffin Ranger reached its goal of $6000, and its stretch goal of $6500, meaning the book will now have five to six interior illustrations by artist Katie Hofgard. Seventy-five backers combined for a total of $6,525, including 10 backers who donated over $100. The book is planned to be released in January of next year, depending on editing and when the editing and art for the cover can be finished. The book is already written, and a part two is also planned. Thanks for the write-up. A slight correction-- Griffin Ranger is a novel in two parts, and both parts are complete, not just part one. Let's hope the writing is good. I am picky with the media I consume. I helped proofread it for Roz. It's good enough that I expect it to win awards. Let's hope it's Stephen King level good. That's a loaded statement. There's a lot of people who poo-poo Stephen King. But he is one of my favorite authors. At the very least, never mind quality, you probably wouldn't mind King level sales. Expecting things winning awards is always the way to set up disappointment when they ultimately don't. And yes, I'm still commiserating over Dust: An Elysian Tail losing to Vampire Skyrim DLC in Ursa Major Anthro Video Game of 2012. And I always will be. On the plus side, it's why I'm going to be trying to focus on reviewing more furry games. When work isn't killing me as it has been lately.